His farm borders the Nandamojo river, land where forest cover is crucial to protect a waterway that has suffered through droughts in recent years. 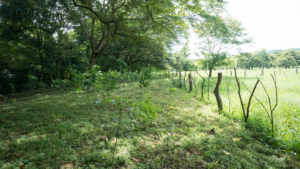 The previous owner deforested the land almost entirely, but over the last several years Gutiérrez has planted saplings within 50 feet of the river and built a barb-wire fence to keep cattle from trampling the trees. 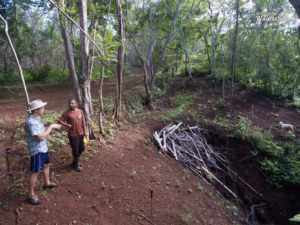 He has done so with the support of Restoring Our Watershed (ROW), a U.S. and Costa Rican non-profit organization that is helping communities confront the challenges of climate change. As a young adult, Gutiérrez worked hard to feed his family and send his eight children to school. During the 1980’s, at the age of 55, he received his farm from the Costa Rican government as part of a national effort to provide economic opportunities through agricultural development. 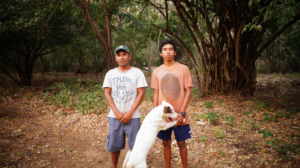 Since then, he has felt more prosperous, harvesting corn and raising cattle. Reforesting the river corridor, along with half a dozen neighboring farmers, is his latest project. 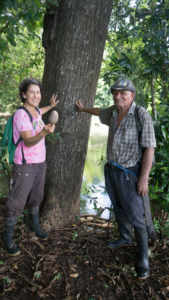 As someone who has benefited from once-abundant water resources, Gutiérrez sees the urgency to reforest and is doing his part to protect the Nandamojo river. Henry Campos Gómez, whose family owns a 100-hectare farm in Costa Rica’s northwestern province of Guanacaste, remembers a time whenit rained enough that their land could bear three harvests of corn per year. But over the last century, the region has dried out due to a toxic combination of a changing climate and deforestation, losing about one centimeter of rain per year on average. The lack of rainfall has taken its toll on farming families like Henry’s, who lack any access to irrigation. Now there are years when one good harvest is considered a success, and during a historic drought in 2014 and ‘15, Henry’s family was shocked to see one of their permanent springs dry up for the first time in memory. Campos lives in Paraíso, a small town in Guanacaste’s Nandamojo river basin where the non-profit Restoring Our Watershed (ROW) is working to help families like Henry’s confront the challenges of climate change. They do so by empowering watershed residents to adopt land use practices that infiltrate more rain into groundwater aquifers. For Henry’s family, retaining more rainwater in areas that supply springs could ensure that they flow year-round, even during droughts. It is clear he knows there is more to be done on a communal level. He describes frustrating challenges with bringing people together in Guanacaste and starting collective efforts to address climate change and drought-related challenges. It is a cultural constraint, he says; Costa Rican land owners are usually resistant to committing to meetings. As a landowner in the watershed this frustrates Campos, but he understands how it can be hard for farmers to keep longevity in mind when the immediate environmental issues threaten their livelihoods. Nonetheless, Campos sees a promising future for the region, related directly to landowners’ abilities to improve groundwater recharge. He remembers a time when a stretch of land adjacent to his family’s farm would be covered with water for long periods, and imagines a future in which that will happen again. 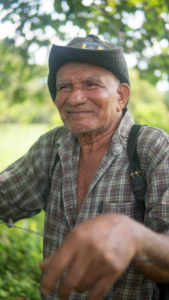 He has an optimistic attitude towards changing farming techniques in Guanacaste and understands his important role as a model for how one person in the watershed can adapt to climate change. Campos has been an avid participant in ROW’s efforts. In 2015, he reached out to Matt Rosensteele, ROW’s executive director, asking for saplings to jumpstart reforestation on his family’s land. 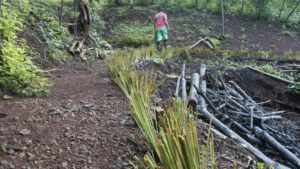 Shortly after that, he began planting vetiver grass to combat erosion. 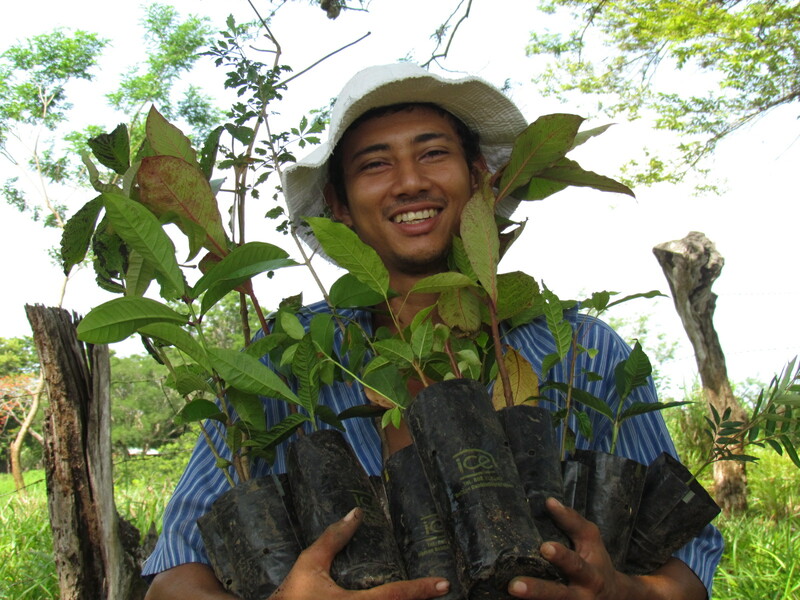 Most recently, he joined ROW’s Bees for Trees program, through which landowners receive small loans to produce honey. Campos took advantage of the opportunity to become involved with Bees for Trees soon after Rosensteele proposed the idea to him. Maintaining the bees is one of the many things on his land his son Jose Maverick, who is in high school, helps Campos with. As a landowner who is acutely aware of the challenges — both financial and cultural — associated with big changes to land use, Campos has a nuanced point of view on the struggle between long term environmental longevity and immediate financial needs in Guanacaste. ROW’s Bees for Trees program aims to make both goals possible for families like Henry’s. One of the key components of ROW’s strategy is bringing people together around struggles related to climate change and their goals for the future. They host annual gatherings called “CosechAgua” (HarvestWater), during which landowners learn how to use simple water protection strategies, receiving plants and materials to use on their own farms. Campos participated in the first annual event in 2016, offering his family farm as a site for a model project. 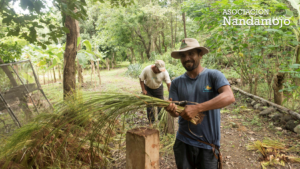 Campos and a dozen landowners from various parts of the watershed planted vetiver grass along his land to combat erosion, and bamboo throughout their farm to slow down rain water, letting it sink into the soil. Throughout his life, Campos has seen rivers dry up and felt the impacts on the community. He has seen the tourists flow into the hotels being built irresponsibly in the coastal towns, eroding crucial estuaries and sucking up what is left of the water the region shares. He has seen the rainy and dry seasons become more and more exaggerated and felt the loss of harvests. Since every drop of water in the watershed is essentially shared among everyone living inside it, Campos wants landowners to come together. After CosechAgua last year, he described how, beyond the physical changes to his land, that weekend he was able to collaborate with acquaintances he sees around the watershed, but who he had never actually worked with. He believes collaboration like this between landowners is the next big barrier ROW and locals face in the fight for a sustainable future.